Colorado Party Rentals has everything you need for an anniversary celebration. Whether it is a wedding or anniversary, we can make it the year to remember with our event rentals for your special occasion. If you have an anniversary coming up, or a parent who does, consider throwing an anniversary celebration. Along with the celebration comes gifts. The tradition of giving a specific gift on specific anniversaries dates back to the Middle Ages. Today we give you traditional gift ideas, and flowers for celebrating anniversaries for years 1- 75. These traditional and practical gifts add meaning and significance into your anniversary. Use it now or keep it for later! The traditional gift for the 1st anniversary is paper. It symbolizes strength which comes from the interlaced connection of the paper’s individual threads. The flower for the 1st anniversary is the pansy. The traditional gift for this anniversary is wood. Wood is strong and long lasting, representing strength and solidarity. A more modern spin on wood is silverware, representing connectedness. The flower for this anniversary is the daisy. Daisies mean innocence, loyal love and purity. Although this may seem odd, the tenth anniversary gift is tin or aluminum. The pliability of tin is a symbol of how successful marriages need to be flexible and durable. Tin can be bent without being broken. The flower for the tenth is the daffodil, representing joy, triumph, cheerfulness and happiness. The 15th year anniversary is meant to symbolize the clear and sparkling love between the two with crystal. A modern alternative is the watch. This symbolizes the time you’ve had together. Roses are the flower for this anniversary which represent passion, love, and perfection. Year 20 is a milestone anniversary. A year to reflect on the years spent to together and the commitment made. China is the gift for this anniversary, symbolizing the beautiful, elegant and delicate love you have for each other. The day lily is the flower of the year, showing the playful love and behavior towards one another. This anniversary is silver. Silver is the metal most noted for this anniversary because of its radiance and brilliance. The iris is the flower for the 25th, however, there are several roses named after this anniversary. A few are Silver Star Rose, Sterling Silver Rose and Silver Jubilee. The perfect gift for the 30th is a pearl. Given in the form of a pearl necklace, or earrings, or any other pearl variety. The flower is the Sweet Pea. Coral is the gift for this anniversary. A modern alternative is jade, typically given in a jewelry setting. This is another momentous year to celebrate. The gift for the 40th is the ruby. In ancient times, the ruby was and still is more valuable than diamonds because of its rarity. The flower is the Nasturtium. This is the year to celebrate! Year 50 brings in the gold! Known as the golden anniversary. Wealth is associated with gold, it is strong, resistant to corrosion and beautiful. The flower for the golden year is the violet, symbolizing passion. The 60th anniversary to the 75th anniversary is notably recognized with diamonds. Diamond comes from the greek word, adamas, meaning unconquerable and enduring. The fire in the diamond symbolizes the constant flame of love. There are no flowers associated with the diamond anniversaries. You can put together a white flower from each year, using the flowers associated with the years, incorporating into one bouquet. to Book Your Anniversary Party! 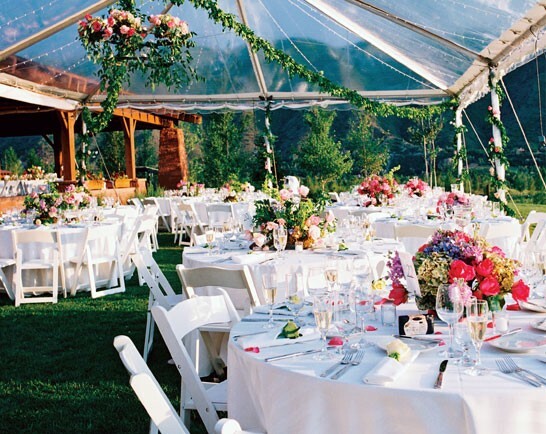 We are Colorado’s premier rental company, located in Denver, offering the finest wedding, party, tent and event rentals. We provide superior, high quality equipment, friendly and knowledgeable customer service, and prompt delivery and setup by a professional staff to help make your event special! Call Today!